Losing weight while keeping your breast size is challenging. From an anatomical perspective, the breasts are highly composed of fat. This makes them prone to shrink when you lose weight. However, by taking the right approach, you can at least keep your breasts perky and lifted. This involves dietary adjustments and the right exercise regimen. Reduce your normal daily intake by 500 calories. This will cause about 1 lb. of weight loss a week. Determine your current average intake by tracking your calories for five days. Add the totals together, divide by five, then make your reduction. For example, if you come up with 2,200, your new intake will be 1,700 calories. Lose the unhealthy eating habits to lose weight. Give up the white-flour products, processed meats, candy bars, ice cream and fast food. Base your diet on foods that have a low energy density like fruits, vegetables, whole grains, low-fat dairy and lean meats. Low energy density foods take up a lot of surface area, but are low in calories. Eat multiple times throughout the day, but keep your meals small. This will boost your metabolism and keep your appetite under control. Have your first meal as soon as you wake up and eat every two to three hours afterward. A cup of low-fat yogurt with berries mixed in is a healthy meal option. Perform cardiovascular training to further promote weight loss. Keep your sessions in the range of 45 to 60 minutes and workout at a moderate pace. Choose a form that you enjoy, such as brisk walking, biking, running, elliptical training, stair climbing, swimming or kickboxing. Work out three days a week on alternating days. Execute a chest workout to target the pectoral muscles. The pecs run underneath the breasts. Building these muscles up will help keep your breasts lifted as you lose weight. Target the entire chest with exercises like incline presses, flat bench presses, decline presses and flys. 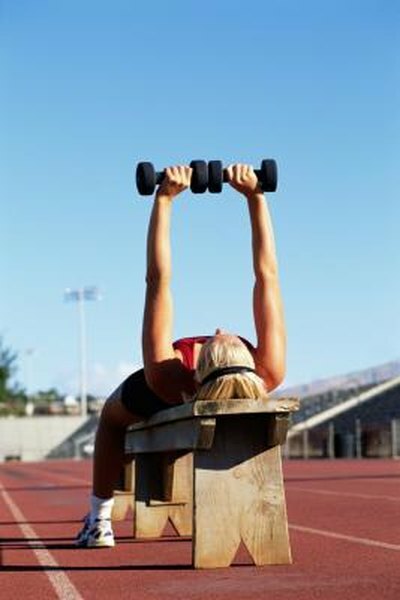 Aim for eight to 12 reps, do four or five sets and use the heaviest weights you can handle. Have a spotter on hand for assistance if need be. Train three days a week on noncardio days. Use proper form with your weight training exercises. Move through a full range of motion, never use momentum and keep your body in good alignment. For flat bench presses, lie face-up on a bench and hold dumbbells straight above your body with your arms extended and palms facing forward. Lower the weights down to your sides by bending your elbows and stop when you feel a good stretch in your pecs. Push the weights back up in a steady motion and stop them an inch apart. Squeeze your pecs for a second and begin your next repetition.